Sneak off to the welcoming lobby seating area when you've got an hour free. Call it a living room or "day-planning headquarters" - either way, it's where a show of hands will determine the next only-in-Vegas activity. Somewhere between dinner ending and your movie starting, see who's game for a soak. Fitness center offers a nice counterpoint to the endless buffets and late night cocktails. Gather up your armloads of inflatables and make a day of it. The Bellagio Fountain show is well worth the 1.4 mile stroll. Five minutes from the airport and an easy fifteen from the convention centers, the stucco and terra cotta Mediterranean-style Desert Rose is a quiet, family-friendly, non-gaming venue adjacent to Hooters Hotel & Casino just a block and a half off the Strip. The heated pool is the highlight, so gather up the inflatables and goggles and head out early (well, as early as you can round up your late-sleeping troops). Pull a few loungers together and angle your chair for maximum rays while keeping clean sightlines to the kids in the pool (just out of cannonball splashing range). When you start smelling your fellow guests’ burgers on the grill, head up to your suite and bring down a platter of your own grillables. Put the kids in charge of condiment-carrying and lay out your feast poolside, surrounded by tropical plants and, if you time it right, an amazing sunset. You’ll know you’re fully settled into your condo when you trip over one of the kid’s pillow pets or LEGO creations (ah, home sweet home). One- and two-bedroom suites range from 650 to 900 square feet, and easily sleep four to six. (The pullout sofa means no one gets relegated to the floor.) The well appointed kitchen has full size appliances, granite countertops and a dining area. So even if local takeout is more your style (at least on vacation), you can still gather the family around the table. Private balconies and patios are happy hour-ready. Just pour some cold drinks and round up easy appetizers from the onsite convenience store and you’re good to go. Venturing out? 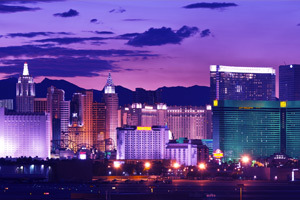 Hop the monorail to Vegas mainstays like Mandalay Bay, the Luxor, Excalibur, New York-New York, Monte Carlo, Bellagio, Caesars Palace, Paris and Bally’s. Catch classic shows from Blue Man Group to Cirque du Soleil, or hit one of the dozens of local golf courses. Looking for a family-friendly place for dinner? Try the “thunder-stormy” Rainforest Café (near Miracle Mile shops), go for spicy Cajun/Creole at House of Blues at Mandalay Bay, or get crazy with build-your-own ramen dishes at Itsy Bitsy near the famous Fremont Street.